Page one of "FISHING THE INDIAN RIVER LAGOON" described the four principal species sought here, as well as the basic tackle required to get you started. On this page we discuss Locations in and around the city of Titusville to fish, whether it's by foot, canoe or kayak, or by motorboat. The northern portion of the Indian River Lagoon is bordered by Titusville and North Brevard on the West and the Merritt Island Wildlife Refuge on the east. Connected to the Indian River to the east by Haulover Canal is the southern portion of Mosquito Lagoon, bordered by the Merritt Island Wildlife refuge on the west and Canaveral National Seashore on the east and south. Both bodies of water have world class fishing for redfish and seatrout. At the bottom of this page is a table of other species that are commonly caught in these waters, increasing the fishing opportunities. 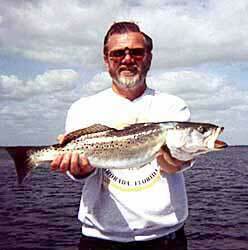 Having a boat in the Titusville area greatly increases your opportunities of finding fish. Due to the presence of the Merritt Island Wildlife Refuge and Canaveral National Seashore there are numerous places to launch a canoe or kayak which allow you to put in waters protected from the wind no matter which way it's blowing. However, the presence of these areas also provide numerous areas where catching good sized fish from shore is a distict possibility, more so than what's available in other areas of the state. Within the city limits of Titusville are several riverfront public parks, some of which have docks for public use that have produced reds and trout. Rotary Riverfront Park at 4141 South Washington Avenue, is found on the Indian River just south of the McDonalds about a mile or so north of the intersection of SR 50 and U.S. 1 (Washington Ave). A fairly good sized dock extends out over grass flats to about 2-3 feet deep. Space View Park at 8 Julia Street is in the heart of the Historic Downtown Titusville and features a fishing and boating dock. Sandpoint Park at the intersection of U.S.1 and S.R.406 is a recreational Park. It does not have a dock but by going in the U.S. 1 entrance and following the road to the last parking area you come to a peninsula of land that separates the Indian River Lagoon from the Titusville Municipal Marina. I have fished both in the yacht basin and the lagoon itself from the shoreline there and caught trout using live shrimp under a bobber. At the end of this peninsula is the channel connecting the basin and the lagoon. Mangrove Snapper and other species can sometimes be caught near the rocks lining the opening. The eastern half of the Max Brewer Causeway leading to the Merritt Island Wildlife Refuge is a popular spot and some good size reds and some nice trout have come from this area. Just after the bridge portion of the causeway is Parrish Park with a boat ramp, parking area, and a fishing boardwalk on the north side and a smaller parking area and boardwalk on the south side. You can also Park to the east of these areas and fish the flats on both sides of the causeway. Again, some nice reds and trout have come from here. Right after you cross the Max Brewer Causeway you enter the Merritt Island Wildlife Refuge. Years ago, dikes were built to form mosquito control impoundments. Some of these dikes can be driven on and provide access to some pretty good fishing. When driving along any of these dikes pay attention to the location of culverts. These culverts are used to control the water level in the impoundments. Look for water flowing through these culverts. The outflows of these culverts have produced some of my biggest trout, including my largest, 7 ½ lbs. They also attract reds and occasional snook and tarpon. When preparing to fish one of these culverts, do NOT park your car on top of the culvert and get out. Either pass the culvert and stop 100 or so feet beyond or stop before it. Fish CAN see and hear your presence. Get out of your car from this distance and slowly approach the culvert keeping a low profile. Do not approach all the way to the culvert. Cast to the pocket of water adjacent to the culvert from one side using a freelined live shrimp, or some thing else you can present with care such as a weedless bass assassin. Fly fishing tackle with a shrimp pattern works great here. At the very entrance to the refuge just after the causeway there is a small parking area with an informational kiosk on the right. Leading to the south from this parking area is a dike with a dirt road that first follows the eastern shore of the lagoon and then turns to the east as it follows "Gator Creek" around for several miles until it eventually runs back into the main road . Fishing can be quite good here. A little farther down the road on the left is a dike road called "Pump House Road". This leads to a cove and then turns to the east along a small canal on the north side and an extremely shallow impoundment on the south. Fish the area on the north side. I've pulled trout out of this area. Follow the road to the pump house and you will see a dike road heading to the north that is usually roped off. Park here and fish the area just to the east. I've caught trout and ladyfish from this pocket and seen quite a few small tarpon rolling and chasing small baitfish. Seems to be a pretty active pocket. By staying on SR 406 until the Black Point Wildlife Drive turnoff, taking the turnoff and then continuing to the east until the road ends, you come to SR 3. Head north on SR 3 and you are headed towards Haulover Canal. As you head north, you will see several dirt roads marked as public access roads. The roads to the right will lead to the Indian River Lagoon, often along different canals and creeks, which offer they're own opportunities for fishing. In the winter when the weather gets cooler trout will often gather in these canals in large numbers. The best bait during this time is live shrimp. The roads to the left will lead to the mosquito lagoon, giving you an even greater variety of options. Some of these roads are closed off to the public and these are plainly marked. offers it's own fishing opportunities by adding mangrove snapper and black drum as well as other species to the menu. These can be caught by either freelining live shrimp along the rocks at the edge or using the weighted rig described earlier with live shrimp. North of Haulover are more dirt roads leading to the lagoon, the same conditions apply as for those south of Haulover. There is one access point to the Mosquito Lagoon from the seashore property, Eddy Creek. To get to Eddy Creek, Drive from Titusville on the Max Brewer Causeway east across the Indian River Lagoon, past the refuge visitor's center until you come to the stoplight. Go straight through the stoplight, pay the $5 fee at the seashore entrance, and follow the road as it winds through the wetlands until it turns to the north. There is also a turn to the South, however it is off limits to the public due to it's proximity of to the Space Shuttle Launch pads. opens up a lot more territory and options for fishing. Paddling across the flats allows you to get close to tailing reds and feeding trout as quietly as wading while allowing you to cover much more territory. You can also access places that most boats cannot go. It is simply my favorite way to fish. PLACES TO PUT IN, PLACES TO FISH. Starting in Titusville, three launch sites come to mind, The first is Kennedy Point Park, a county park located between the Kennedy Point Yacht Club and Holiday Inn Hotel, on U.S. 1 just south of the SR 50 stoplight. Put in here and paddle out the yacht basin and paddle to the south until you pass the Holiday Inn and Don's Riverside Restaurant. There's a spit of land that goes out into the river and from there to the NASA causeway is a prime area. A paddle to the north of the yacht club to just east of the US1/ SR50 light puts you on more productive flats. Launching your canoe from the Sand Point Park and paddling to the north puts you on another set of impressive flats. You can also put in off the northeast side of the Max Brewer Causeway and then follow the shoreline as it goes to the east and then turns to the north. There are some good flats on the inside of this curve. Putting in on the south side of the causeway puts you on more productive grass flats and following the eastern shoreline of the Indian River Lagoon, (IRL) will take you to the mouth of Gator Creek and beyound. After the Max Brewer Causeway (SR 406) you are now on the refuge. About half a mile past the entrance on the left is a dike road called Pump House Road. Turn left onto this road and go about ¼ mile until it turns to your right. Stop here. You will see a less developed dirt road heading straight ahead and another, even more overgrown (impassable) one to the right. Park at the entrance of the one of these other two and launch your canoe or kayak in the corner of cove you just drove up to. There are some fish in this cove, which is only about 1-1/2 feet deep in most areas. Paddle from here to the mouth of the cove. Lots of grass flats and fish activity here. Farther down SR 406 you will see the Black Point turnoff. Follow this road to the intersection of SR 3 and turn left (north). About 1 ½ miles on the right you will see NASA's Atmospheric Sciences Field Laboratory. The entrance to this facility also leads to a public use boat launch with a dirt boat ramp. Put in here for grassflats reds and trout fishing. Farther to the north on SR 3 you will see several dirt roads leading from SR 3 marked at public access points. The ones on the left (west) will lead to the IRL while the ones on the right (east) lead to the Mosquito Lagoon. While heading north, look for a sign on the left marking the access road to Dummit's Cove. It should be about one to two miles to the north. Nice grassflats for trout and reds in the cove. A little farther to the north is Haulover Canal, which connects the IRL to the Mosquito Lagoon. Both of which have extensive grass flats in the area. Fishing the canal itself opens up opportunities to add black drum, mangrove snapper, sheepshead and others to the fishing action. Fish a live shrimp along the shoreline rocks and keep an eye on the boat traffic. Once past Haulover Canal, there are still several more access roads to the IRL and Mosquito Lagoon to launch your canoe. All of which will put you on redfish and trout flats. The Mosquito Lagoon can be accessed from one site from the south district of Canaveral National Seashore. From Titusville take the Max Brewer Causeway to the Merritt Island Wildlife Refuge, veer to the right at the Black Point Wildlife Drive Turnoff and continue straight past the stoplight and you will come to the ranger shack for Canaveral National Seashore. To get to the Eddy Creek put in stay on the main access road after you pass the ranger shack and continue until the road turns to the north at the beach. Continue north until you come to parking lot # 8 on the left. This is Eddy Creek. If you paddle out of this basin you will come to an extensive set of flats and islands that are the remenants of an ancient inlet delta. the flats surrounding these islands hold quite a few nice reds and trout as well as provide exellent bird and wildlife watching. There are several boat ramps in the Titusville area that allow you to access virtually all of the northern Indian River Lagoon and southern Mosquito Lagoon and their many square miles of fishing. located on US1 just to the south of the US1 / SR50 intersection in south Titusville between Kennedy Point Yacht Club and the Holiday Inn. Direct access to good flats fishing to the north and the south of the boat ramp on the west side of the river. located on the north east corner of the Titusville Municipal Marina basin, about a block north of the intersection of Garden street and US1 on the east side of the road. The entrance to the marina is next (left) to the entrance of Sandpoint Park. Follow the access road around the marina basin and turn right at the Marina Park softball fields. The boat ramp goes into the marina basin on the northeast corner. Across the lagoon from the marina are some good grass flats along the wildlife refuge shoreline. Also try the flats to the north on the west side of the lagoon. located on the north side of the Max Brewer Causeway just east of the main bridge. Take the Max Brewer Causeway east until you come to the Black Point Wildlife Drive turnoff and then take this road past the entrance to black point until it ends at SR3. Turn left and drive to the north until you see the bridge at Haulover Canal. Turn to the left before going over the bridge and follow the road to the canal and then to the west along the canal. You will soon come to a small basin and boat ramp. follow the directions for Haulover Canal above until you turn north on SR3. You will find the entrance to the laboratory about 1 ½ miles north of the SR3 intersection on the west side of the road. Take this entrance past the laboratory and a dirt boat ramp suitable for smaller boats will be found at the end of this dirt road. Take the Max Brewer Causeway ( SR 406) over the lagoon onto the refuge and stay to the right as you pass the Black Point Wildlife Drive access road and then the refuge headquarters. (you are now on SR 402). You will come to a stoplight at the intersection of SR 3 and SR 402. Stay on SR 402, pass the ranger shack, (pay the $5 fee) and continue until the road turns to the north at the beach. Continue north until you come to parking lot # 8 on the left. This is Eddy Creek and the flats just outside of the mouth of this creek provide still more great fishing for reds and trout. So far, the information given has been dedicated to catching the primary gamefish species found in the lagoon. However, there are numerous other types of fish that can be caught in the lagoon that can provide hours of fishing enjoyment. The table below describes some of the more common catches. Jack Crevalle are usually caught by accident while fishing for other species. However when hooked, they can take off on extremely long runs and put up a fight that leads you to beleive that you've hooked a much larger fish. They will strike almost any live bait or lure. The average size in the lagoon is about 2 lbs but can get up to about 10. Much larger offshore and in inlets. Don't be suprised if he cuts your line off if not using a leader as their mouths are very rough on monofilament line. If targeting these fish, use a 20-30 lb. test mono leader. no bag limits. Not much food value. Ladyfish are usually an incidential catch while fishing with live baits or lures for reds and trout. kinda fun in that they jump like a miniature tarpon when hooked. average size is about 1 lb. while sometimes you will see one to 2-3 lbs. No bag limits, Not much food value. Mangrove Snapper, sometimes called gray snapper like to hang around rocky areas such as the shoreline of Haulover Canal or the entrance channel to the Titusville Marina along Sandpoint Park. They will take live shrimp freelined near the rocks readily. Larger ones found near ocean inlets will take finger mullet. Some fishermen have been enjoying some success flyfishing shrimp patterns along the rocky shoreline of Haulover from a boat. The daily bag limit is 5 mangrove snapper per day, each of which must be a minimum of 10 inches in length. If fishing in an area with other snapper species such as offshore reefs, then the bag limit is 10 snapper per day of all species combined. Good eats. Black Drum grow to be quite large, sometimes exceeding 50 lbs. They are primarily bottom feeders and can be caught on shrimp, fiddler crabs, blue crabs broken or cut into portions. They can be caught around rocks, bridge pilings, and deeper holes in the river. Haulover Canal is probably the best bet in this area. They occasionally are caught in the surf at Playalinda Beach while fishing for whiting. Sheepshead like to hang around pilings, rocks, oyster beds and other structure where banacles grow. They sometimes venture out onto the flats in search of small crabs and shrimp. they do not strike very hard and are known bait stealers. fish for them around the rocks at Haulover Canal and around bridge and dock pilings in deeper water with either shrimp or fiddler crabs on a size 1 hook rigged with a leader and an egg sinker to keep your bait near the structure. Croakers are usually caught on the bottom on pieces of cut shrimp with a size 2 hook. I consider them a "potluck catch" where you cast a weighted rig with a piece of cut shrimp and wait to see what hits. Often caught in the surf while fishing for whiting. No bag or size limits. Good eating. Pinfish or Sailor's Choice can be caught with pieces of shrimp on a size 2 hook fished under a bobber or cork. When fishing for seatrout or reds over the flats, with live shrimp and you get a strike and retrieve your line with only part of your bait left, these are the likly culprits. They inhabit grass flats, canals and just about everywhere else. Another "potluck species". No bag or size limits, supposedly good eating if you can get around the bones.